Maximize space while creating an impressive display. This full-motion TV wall mount, made of heavy-duty steel, securely supports flat-screen TVs from 32" to 55". The arm extends easily to provide smooth, full-motion positioning for ideal viewing.Mount your flat-screen TV in a location that's convenient for visitors, clients and employees. This TV wall mount is ideal for the lobby, boardroom or other venues, providing an impressive and secure way to display a flat-panel TV or mount digital signage. It also frees up valuable space. The TV wall mount supports most 32" to 55" (558.8 to 1397 mm) LED or LCD flat panel TVs weighing up to 77 lb. (35 kg).The TV wall mount provides full-motion adjustment capability. The arm extends up to 19.8" (503 mm) from the wall to provide a wide range of movement and accommodate different screen positions and angles. The arm can also fold to tuck-in closely to the wall, providing a minimized profile, which enables you to position your display just 1.9" (49 mm) from the wall.The TV wall mount swivels +90 / -90 degrees to provide maximum viewing flexibility. The mount also tilts +2 / -12 degrees, letting you angle your TV display toward your audience. With the tilt feature, you can mount your TV lower or higher than eye level and still view it comfortably.The robust steel design safely and securely supports your flat-screen TV, to protect your investment. 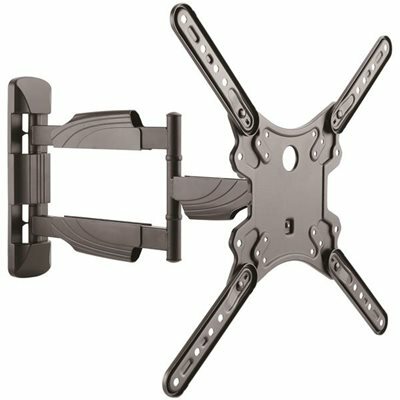 The TV wall mount also includes plastic brackets for cable management to keep cables neatly out of sight. The TV wall mount provides full-motion adjustment capability. The arm extends up to 19.8” (503 mm) from the wall to provide a wide range of movement and accommodate different screen positions and angles. The arm can also fold to tuck-in closely to the wall, providing a minimized profile, which enables you to position your display just 1.9" (49 mm) from the wall.